On Saturday, for the first time this trip, we spent the day in port, and it was a beautiful one. Despite a forecast of high 60s and rain for much of the day, the clouds lifted by 10 a.m. We perused the farmers market just a few steps from our slip, where a strapping young lad working one of the stalls gave Claire a sunflower as big as her head. We dug around town, trying out the coffee shops (I love Petals and Perks!) and making big teddy bear friends at The Bookstore. We even went for a stunning beach walk along the sand cliffs just north of the channel. All of the fun wore Claire out so much that she actually napped – a miracle in itself! While she snoozed, Mark and Nikki, a lovely couple who also live in Oak Park and sail (they own a boat and Mark races with Aaron on Turning Point), met us on Clarity and then drove the three of us out to Landmark, their 40-acre playground about a 30-minute drive inland. The property includes inviting log cabins, a vineyard and a masterful red barn that everyone gathers around to eat and chat. It was a relaxing evening of great company, with plenty of dirt for Claire to dig around in, trees to hide behind and caterpillars to befriend. She even went on her first dates – yep, that’s dates, plural. Two men in one night – Nikki’s nephews. 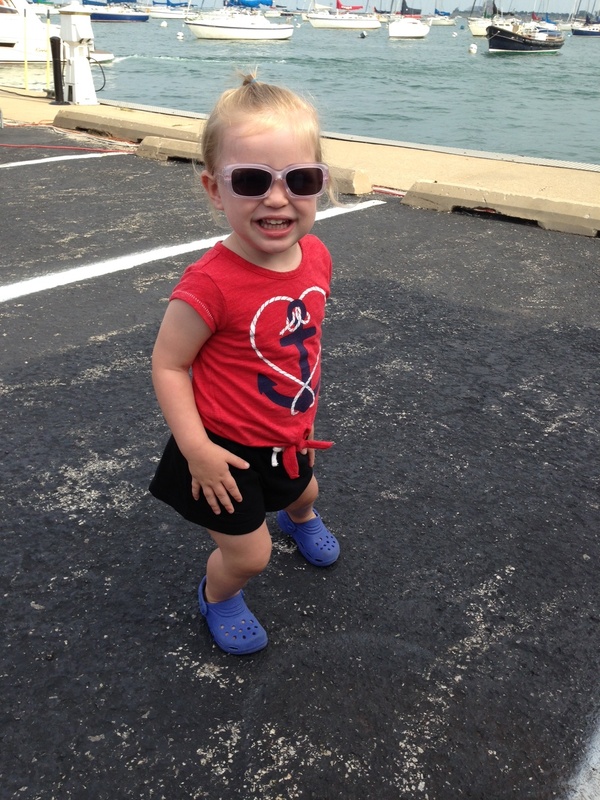 Claire’s gonna be a heartbreaker. We drove back to Clarity, got Claire down and collapsed. This morning, we took a quick trip to Point Betsie lighthouse before setting sail for Leland! More on that later. Here, some Frankfort snapshots. A sunflower as big as her head! A lunch of brats and homemade guac while Claire napped! The sunflower lights up our salon. Can I drive it, daddy? We are currently tucked away in our slip in Frankfort, listening to the waves lap against the stern, and I am amazed at what we have accomplished. Clarity is now in uncharted territory! Last year when we took our month-long trip, we made it as far as Manistee at the end of two weeks before turning the boat around to head back to Chicago. It was our first family cruise and we had had a number of mechanical issues that plagued us all along the way. Manistee felt like as far as we could push. In less than a week, we’ve made it a full port further north than we managed in two weeks last year. I am so proud of us. The evening we got into the Muskegon Yacht Club, we reconnected with a wonderful couple we had met there last year – salt-of-the-earth, good people. 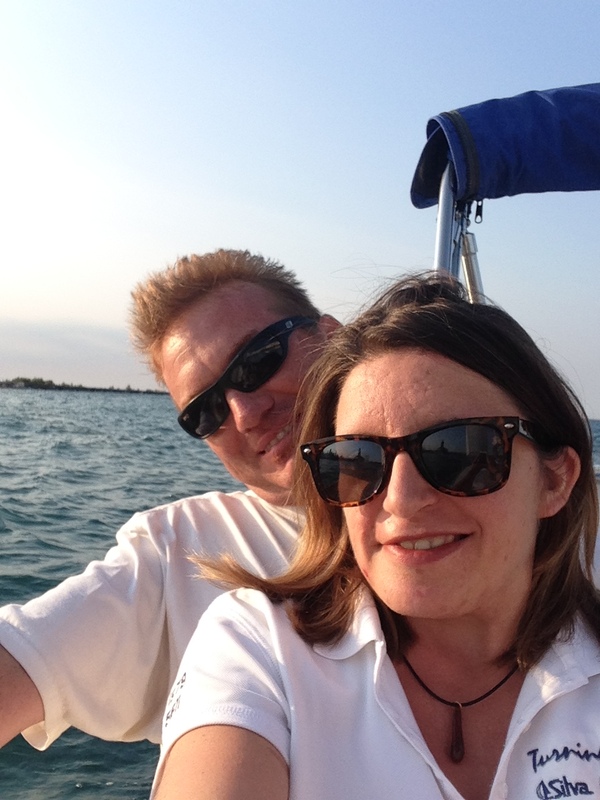 They were sailing up to Ludington the next day, which was our next stop, so we spent the nine-hour sail yesterday racing each other up the coastline and throwing jokes back and forth over the radio. It was a memorable sail, followed by a memorable evening in port, telling stories and drinking too much tequila. It was as if we had known them for years. Based on the weather forecast, we planned to spend today in port, but halfway through the morning, there was a break in the rain and the forecast and waves looked decent. Our friends headed south to Pentwater and we headed north, intending to go to Manistee. The first part of the sail was a bit rough, with moderate waves, but once we rounded Big Sable Point, the lake laid down a bit and we were on a better point of sail with following seas. As we were getting close to turning on the blinker and heading in to Manistee, Aaron jokingly said, “You’re going to hate me for telling you this, but Frankfort is only about three hours farther.” Claire was happy as a clam, the conditions were great, we were flying along between 7 and 8.5 knots boat speed downwind, and it was only 1:30 p.m. We thought, what the heck?! Let’s do it! Already, this trip has made me so in awe of what we can accomplish – and have fun doing it! And, it has made me even more in love with my family. Tomorrow, a day in port (for sure). Living part-time on the boat for half of the year is an incredible blessing, and one that we take advantage of for as long as we can. But along with that “glamour” of life on the water comes the reality that it’s a lot of work. Not double the work of one home. It’s at least quadruple. My responsibilities of keeping up the household at home transfer to the boat, too, which means making sure both are fully stocked. This includes food, clothes, toiletries, cleaning supplies, diapers (hopefully for not too much longer), etc. Many times, I’ve been sure that I had plenty of wipes at the boat, for example, only to get there and realize that I really should have grabbed some from the box I just bought for the house. I’ve learned the hard way to become very intentional about keeping a mental checklist of what’s where, and for bigger trips, writing it all down. Aside from the material things, there are two houses to clean. Sure, the square footage of the boat is not the same as the condo – if you only include the interiors. With s/v Clarity, keeping the topsides clean doubles the job, and in many ways is much more difficult than vacuuming the saloon and wiping down the head. 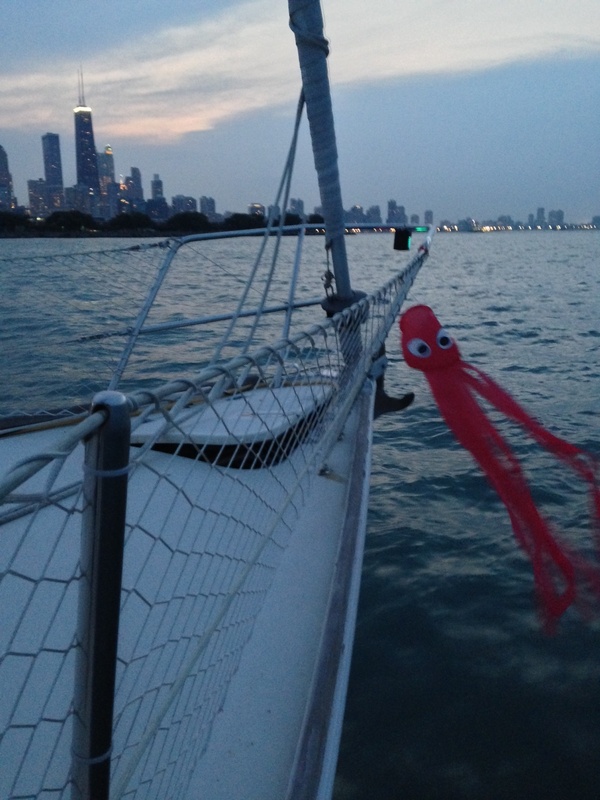 One of the pesky Chicago harbor problems that all boaters have to deal with is spiders. Spiders in mass quantities. As soon as the sun sets, they come out to play, weaving webs around the gates, the dock boxes, and in particular, the boats. We found a spray halfway through last year that keeps them pretty well at bay, but you still have to regularly hose down the deck and brush off the lines and the sails (whadoyaknow – actually sailing helps with this, too!). When we are gone for more than a day or two, we head back to the boat knowing that at least a couple of hours of work awaits us. The plus side? Out of necessity, I have faced my spider fear head on and can now manage it fairly well. On the reverse side, when we’ve been at the boat for days, the condo inevitably gets dusty and Tink makes sure to coat a variety of surfaces with fur. And regardless of the zip code, there are always loads of laundry to be done, meals to be made, dishes to be washed. This doesn’t even take into account all of the effort Aaron puts in to make sure everything on the boat, like the engine, the steering, the toilet, well, works. Maintaining the households and a toddler is a full-time job. One of the other realities is that taking the boat out for day-sails is a lot of work. It requires unhooking the water, AC and cable (I know, first-world problems); stowing anything down below that may fall when the boat heels, like the television (again, first-world problems); getting Claire situated in her harness and tether, and with plenty of snacks and toys to keep her entertained while we cast lines and motor out; and more. And when you get back in, you have to put it all back. But the work is worth it. This past weekend, we got to the boat on Friday afternoon and on a whim, Aaron and I decided to try taking Clarity out for a night sail and putting Claire down while we were out. Amazingly, she went to sleep like a dream, and we didn’t hear a single peep when we motored back to our slip and climbed around the deck to reconnect the lines, which was what we were most worried about. Then, on Saturday, a dear friend joined us at the harbor and we decided to take the boat out again for the afternoon. Claire went down for her nap about a half-hour after we left the dock and snoozed for three hours! Any families that sail with kids know that these chances to actually sail as a couple without one of you having to manage a kiddo are moments to be cherished, and we did. I made us dinner back at the dock and we curled up down below with books for the night. Sure, there were some loads of laundry thrown in there, and lots of scrubbing of the deck (thanks Aaron!). It was a perfect weekend.